Twilite is the brainchild of Jess Barr, guitarist of Slobberbone, and Danny Balis, producer of The Ticket’s Hardline. 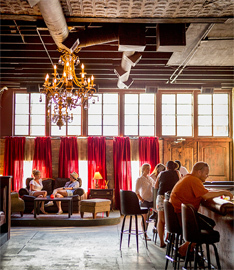 Come for a visit and you’ll find a slice of New Orleans in Deep Ellum. Couples in red vinyl booths talk quietly over candlelight. Guys in their early 30s tip back canned beers as they talk about sports and taco trucks. The menu features beer, wine, and an enticing array of Big Easy-themed cocktails, such as Pimm’s and French 75. Gold lamps and blood-red curtains evoked a distinctly Southern Gothic vibe. A French Quarter-style courtyard contains a small reading area with a bookcase full of beloved classics. If you’re interested in a frozen beverage, go with the frozen Irish coffee, a frothy milkshake-like concoction. Order an extra shot. It’s encouraged.